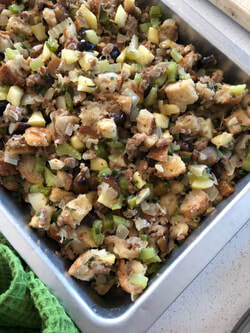 Even though our household LOVES stuffing, we were little skeptical to add yet another pan of stuffing to the Thanksgiving spread. This one makes us a three-stuffing table. Omitting celery put it over the top. The anti-celery faction rejoices and this one rolls celery-free from now on. This is definitely prep-ahead recipe, but only so that you can get the bread to dry out naturally. If you are in a pinch, oven-toasting will work. 1 pound of spicy Italian sausage. Cut bread into bite-sized cubes, with enough to fill about a third of a 9” x 13” pan. Ideally, let bread and dry out on its own schedule. In low humidity CA or when the heat is on, I let it sit out on our counter for two to three days. I’ve found this to be the best way to dry out the bread to the crunchy-but-not-crumbly texture that sometimes happens when you toast the cubes in the oven. In a large Dutch oven, add a bit of butter to the pan, and then add the Italian sausage. Break the sausage up and keep cooking until it just starts to brown and get crunchy. Add onion and jalapeño peppers and cook until the onions are soft and starting to brown. Add apple, garlic, sage, and pepper to taste, and cook until apples are close to brown, but not to the point they are soggy. Add sherry if you have it, and cook down. Add a but more butter and start to add bread cubes. Alternate chicken stock and bread cubes until everything is uniformly mixed and just starting to stick together. Add in kuri at the very end til just combined. Taste it at this point when all the flavors are combined. Add salt, pepper, or sage if needed. Transfer to the 9” x 13” pan. Cover with foil and bake at 350 degrees F for about 40 min. Remove foil, add a little butter in dots at the top and then bake uncovered until the top gets crunchy and just starts to brown. Plays very nicely with Red Kuri Squash Soup as a leftover. The WaPo recipe used arbol chiles, and then took them out. I prefer the simplicity (and kick) of leaving finely chopped jalapeños as part of the stuffing. Plus I’m lazy. The original also required a lot more butter and making a scrambled eggs mixture to bake into the recipe, for a savory sort-of bread pudding. Skipped this, again because I’m lazy. Plus it doesn’t change the flavor, and I like a crunchier texture. I have also used Safeway's Asiago sourdough for the bread and it works nicely too, just tone down the salt.